and born by light of waning moon. as supremely frightful, urging what little life its engine sparked. into remorse and mourning keen, its darkness known and conjured. * This is one of the marvelous woodcuts of Lynd Ward, 1905 -1985, American artist, that illustrated the 1934 edition of Frankenstein published by Harrison Smith and Robert Haas in New York. (Copies of that edition are available through AbeBooks and other rare book dealers.) To see more of the illustrations, go here or see the video below. 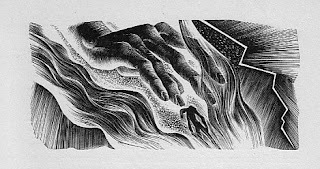 Also of interest: Art Spiegelman, "The Woodcuts of Lynd Ward", Paris Review, October 13, 2010. Also see: Tim Radford, "Frankenstein's Hour of Creation Identified by Astronomers", The Guardian, September 25, 2011. Also of interest: Ron's Green's "Kukai, Founder of Japanese Shington Buddhism"
In addition, see: Hiroyuki Kachi, "Tokyo Show Gathers Kukai Buddhist Art Treasures", The Wall Street Journal, July 20, 2011. This exhibition at the Tokyo National Museum, closed September 25, 2011.
in push to sort and scour. of skin over red, raw heart. This poem is a response to L.L. Barkat's call for poetry about cashmere. You'll find a post about that call on the T.S. Poetry Press Wall on FaceBook. Dehairing is a step in the production of cashmere. Boteh (or buta) means flower and refers to the principal motif associated with Kashmir shawls, the repetitive curvilinear shape called paisley, taken up in the Mughal period and thereafter increasingly stylized. Its different forms correspond to different periods in shawls' creation. Halloween in nearing but don't let today's edition scare you. Still, I hope something here jumps out at you. If you're game, surely you can find your way through the interactive hyperromance, listen to a video about doodling's benefits, watch a real-time data dump, select your choice of free stock video and stock footage for your next project, listen to a Book of Voices from e-Poets Network, or sit on the edge of your seat through a showing of the animated short Balance. ✭ Next time your child is reprimanded for doodling in class, send the teacher the link to Sunni Brown's TED Talk. Sketching and doodling, Brown makes clear from neuroscience research, can improve both comprehension and creative thinking. Known for large-scale live content visualizations Brown is the author of Gamestorming: A Playbook for Rule-breakers, Innovators, and Changemakers. Waste Not from Christopher Baker on Vimeo. Also take a moment to view Baker's HPVA (Human Phantom Vibration Syndrome), Murmur Study, American Toys, My Map (A Self-Portrait), and other projects you can access here. ✭ Unlimited downloads of hundreds of high-definition stock video and stock footage are permitted at XStockVideo. Free, the videos may be used in projects for personal or commercial use, although some restrictions do apply. The footage is shot at 25 frames-per-second and is available in different file formats. Check out the links section for other sites that offer free stock footage, stock audio, and stock images. ✭ The e-Poets Network describes itself as the place "where spoken word lives on the Web". The site offers an impressive collection organized broadly into a library, an aural Book of Voices that includes spoken word, performance, and text and a Videotheque comprising poetry videos and clips of poets in performance. Readings are from poets in the United States, Canada, Australia, and Europe. Also offered: news of interest to poets and an information neighborhood that provides links to publishers, workshops, broadcast language arts, educational programs, and more. 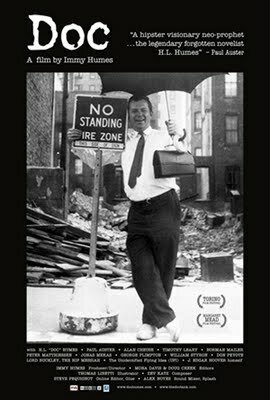 ✦ Harold L. 'Doc' Humes (1926 - 1992) — "scientist, novelist, activist, inventor, filmmaker, architect, prophet, healer, and madman" — is the subject of his daughter Immy Humes's documentary Doc. At The Doc Humes Institute, you'll find information about the film, including a preview and reviews. ✦ Phenomenal photographer Joel Meyerowitz, the only photographer given unlimited access to Ground Zero following the September 11 attack in New York City, has created The World Trade Center Archive, an historical survey of the Aftermath. The archive contains more than 8,000 of Meyerowitz's color images taken over eight months and is available for research, exhibition, and publication at museums in New York City and Washington, D.C. All of Meyerowitz's 9/11 images are being digitized, and each eventually will be catalogued with time, date, location, and description. Funding is needed for the effort. A partial gallery of images is available on Meyerowitz's site. Prints are available for purchase. ✦ The Center for Advanced Study in the Visual Arts (CASVA), a research institute at the National Gallery of Art, Washington, D.C., promotes the study of the history, theory, and criticism of art, architecture, and urbanism. Descriptions of three long-term projects are here. Browse the center's available titles here; they include Romare Bearden, American Modernist. ✦ Today's video is an overview of the exhibition "Edvard Munch, L'Oeil Moderne 1900-1944" ["Edvard Munch: The Modern Eye"] at the Centre Pompidou in Paris. 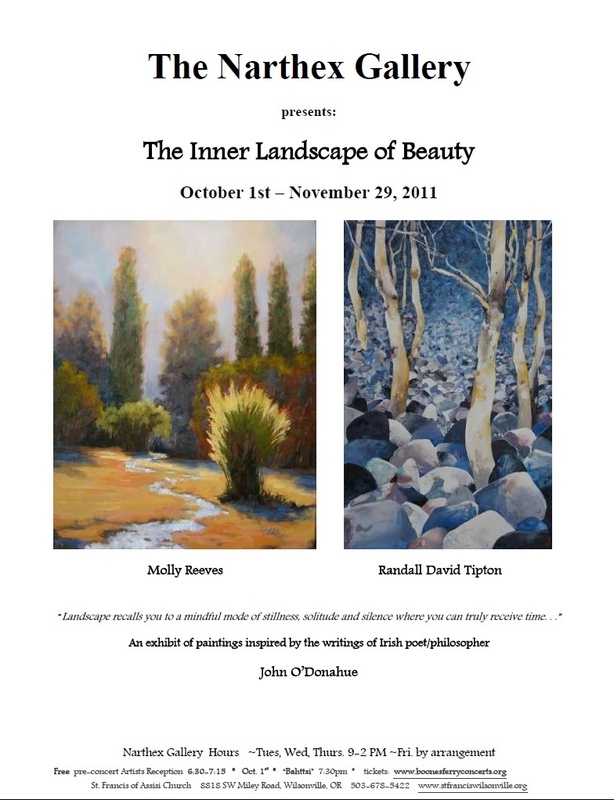 The exhibition opened September 21 and runs through January 9, 2012. ✭ The Joplin, Missouri, George A. Spiva Center for the Arts has mounted "On the Other Side", two- and three-dimensional artworks by professional and non-professional artists created in response to the May 22, 2011, tornado that devastated a third of the city. An Area Artists Challenge, the exhibition is on view through November 6. PBS NewsHour ArtBeat broadcast a program about how the arts are being used to help residents as they try to rebuild their lives and recover from their losses. One arts project involves creation of a community mural depicting Joplin before and after the massive tornado. The mural project is sponsored by Dave Loewenstein and Mid-America Arts Alliance. The Joplin Community Art Project blog chronicles work on the mural. ✭ "Impressionism: Masterworks on Paper" continues at Milwaukee Art Museum through January 8, 2012. Mounted in collaboration with the Albertina Museum in Vienna, the exhibition is the first devoted exclusively to the significance of drawing to the Impressionist and Post-Impressionist movements and to the development of modern art. The show presents more than 100 drawings, watercolors, and pastels by Manet, Degas, Renoir, Cezanne, Seurat, van Gogh, Toulouse-Lautrec and other great artists of the period. Visit the online image gallery. ✭ Prints, drawings, and photographs of 10 Philadelphia artists are on display at the Philadelphia Museum of Art. The exhibition, "Here and Now", which runs through December 4, includes representative work by Astrid Bowlby, the brothers Steven and Billy Blaise Dufala, Vincent Feldman, Daniel Heyman (his work on view includes his 2006 Amman Portfolio, a series of eight prints whose subject matter is about the victims of torture in the infamous Abu Ghraib prison in Iraq), Isaac Tin Wei Lin, Virgil Marti, Joshua Mosely, Serena Perrone, Hannah Price, and Mia Rosenthal. All the artists are between the ages of 25 and 50 and all create works on paper. Be sure to click through to their sites to view images of their work. 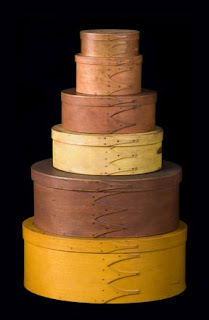 ✭ In Portland, Maine, the Portland Museum of Art just opened "Gather Up the Fragments: The Andrews Shaker Collection". The exhibit, on view until February 5, 2012, comprises more than 200 objects from the Shaker art collection of Faith and Edward Deming Andrews. From the 1920s through 1960s, the Andrews assembled one of the most comprehensive holdings of Shaker art, including furniture, printed works, visual art, tools (e.g., mitten and stocking forms, a spool rack textiles, herbal preparation labels), and small craft works. The exhibition is organized by Hancock Shaker Village, Pittsfield, Massachusetts. View image gallery. Of interest: Shaker Crafts from the Index of American Design, National Gallery of Art, Washington, D.C.; Shaker Life, Art, and Architecture (pdf); and The Shakers, a Ken Burns documentary. ✭ In Atlanta, the High Museum of Art is showing "The Sculpture of Grainger McKoy" through January 8, 2012. The exhibition highlights more than 30 sculptures and drawings of McKoy, who carves, burns, and manipulates wood. Birds, created of wood, metal, and paint, are his principal subject. The show is McKoy's four major exhibition in the past 25 years. (See McKoy's site for an audio slideshow in which he talks about his life and work.) Tickets are required to attend the show. In this 5-minute video, McKoy talks about creating Recovery Stroke. 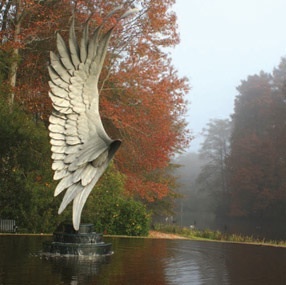 Representing a single wing of a Pintail Duck, the commissioned sculpture weighs approximately 1,500 pounds and whose wing measures 14 feet high (additional information about the sculpture is here; additional images are here). A 30-minute documentary about Recovery Stroke is available through the Swan Lake Visitors Center. It changes you, the best art. ✦ The Artist ~ The creative process is discussed by the internationally known artists Jeff Koons, Ronald Ventura, Cai Guo-Qiang, and Amy Granat. ✦ The Collector ~ Art collectors Guiseppe and Daniel Eskenazi of Eskenazi Limited, a Chinese art dealer based in London, Kip Forbes of Forbes Publishing, writer James Frey, Adam Lindemann, and Budiardjo Tek, president/director of Sierad, a poultry-based food company in Indonesia, speak about their passion for art, what motivates them to collect, and what they've learned in competing with others for the art treasures they want. ✦ The Rostrum ~ Sotheby's own "masters of the gavel", including principal auctioneer Tobias Meyer, chairman Henry Wyndham, Lisa Hubbard, and Chin Yeow Quek, offer their insights and observations about the mechanics of auctions, understanding bidders' mentality, and being part of the bidding at highly competitive art auctions. ✦ The House ~ Staff talk about the excitement of being on the floor of the house and helping bring in a work of art that's come up for sale. In addition to the film shorts, the site includes an online gallery that correlates to each of the segments. Information about the contributors to the series can be found here. Today's Wednesday Wonder, artist Shea Hembrey, knows how to push the creative envelope, stretching it beyond what it can contain. After one too many visits to art biennials around the world, Hembrey says he found himself "longing for several things that I wasn't getting, or not getting enough of", including "more work that was appealing to a broad public, that was accessible" and "more exquisite craftsmanship and technique." Hembrey assigned each of his fictions a gender, gave all the artists appropriate names, figured out their styles, wrote their bios and artist statements, and made all their artworks, which range from oil paintings to large-scale installations to photography to performance art and more. Realizing this was "the kind of project that I could spend my whole life doing", Hembrey gave himself to two years to turn concept into reality. As you'll see in his TED Talk below, Hembrey, a self-described "hick" from rural Arkansas who was in his twenties before he ever visited an art museum, is a talented, determined guy with a great sense of humor, a lot of energy, and no little insight into the contemporary art world. His project raises some fascinating questions not only about what passes for art, how we discern the authentic from the inauthentic, the acquired from the inspired, and what it means to live under the pressure to create, but also about the mind's exquisite ability to juggle multiple tasks while wearing many different masks. Of related interest: Essayist, memoirist, poet, and short story writer Philip Graham has written an excellent post on Hembrey and his project, titled "How Many Selves Hide Inside Us?" Copper Canyon Press, the prestigious nonprofit independent publisher, released earlier this month a bilingual anthology, Push Open the Window: Contemporary Poetry from China, featuring more than 100 poems by 49 poets born after 1945. Chinese editor Qingping Wang, editor of poetry and fiction at the People's Republic of China Literature Publishing House, made the selections and wrote the Editor's Introduction. In the United States, Chinese literature scholars and award-winning translators Howard Goldblatt and Sylvia Li-chun Lin assisted the publishing project and contribute the Preface. According to the publisher, many of the poems in the anthology are appearing in English for the first time. Among the poets whose work is represented in the collection are Shu Cai, Gu Cheng, Bai Hua, Mang Ke, Yu Jian, Zhang Shuguang, Zhai Yongming, Shu Ting, Wang Xiaoni, Xi Chuan, and Zhou Zan. Biographical sketches are included for all. The poets' work, arranged chronologically in the anthology (beginning with Shi Zhi, born in 1948, and ending with Wang Ao, born in 1976), was translated into English by more than 40 preeminent translators from around the world, including Joseph R. Allen, John Balcom, Shelley Wing Chan, Nick Kaldis, Richard King, Steve Riep, and Michelle Yeh. A brief collection of translators' notes is included. Forrest Gander, recipient of the 14th annual Witter Bynner Poetry Fellowship*, contributed the Foreword, "Open Wide". He describes the anthology as "a thrilling slice of Chinese poetry in the Age of Globalization." The featured poets, he writes, "are making Chinese poetry new." The publication has a number of sponsors, including International Literary Exchanges of the National Endowment for the Arts, which supports U.S.-based presses in publishing and promoting contemporary anthologies in translation, and the General Administration of Press and Publication, People's Republic of China, which concurrently published the anthology. To celebrate the anthology's publication, poets Xi Chuan, founder of the literary magazine Qingxiang (Tendency) and editor of Dangdai Gouji Shitan (Contemporary Poetry International), and Zhou Zan, editor of Wings, a journal on contemporary Chinese poetry by women, embarked on a six-city reading tour that began September 29 in Seattle, Washington, at the Seattle Asian Art Museum and ended at the Library of Congress in Washington, D.C., on October 12. The stops in-between were Port Townsend, Washington; Chicago, Illinois, where Li-Young Lee and Maurice Kilwein Guevara joined the reading; Iowa City, Iowa; and New York City, where Marilyn Chin and Li-Young Lee also read at the event hosted at the Unterberg Poetry Center at 92nd Street Y by Forrest Gander. the heart's freedom must be symmetrical to the flow of the water. cupping glasses cup up blood spots from beneath the skin. The anthology is available through Copper Canyon, Amazon, SPD Books, and other booksellers. I'm delighted to own a copy! * The Witter Bynner Fellowship is provided by the Witter Bynner Foundation for Poetry in conjunction with the Library of Congress. In 2011, Gander, whose collections include Core Samples from the World and Science & Steepleflower, and Robert Bringhurst, a poet, book designer, typographer, historian, and linguist, received $7,500 awards. They were chosen by former United States Poet Laureate W.S. Merwin. If nippy temperatures are keeping you indoors, take heart and explore today's edition of Saturday Sharing. You'll find links to the first computer-written book, a site dedicated to J.D. Salinger, the Woody Guthrie Archives, blogs of the Library of Congress, a site for teaching American history, and some Edison Companies' downloadable films. ✦ Described on its cover as "The First Book Ever Written by a Computer", The Policeman's Beard Is Half Constructed: Computer Prose and Poetry by Racter (short for raconteur) may be viewed in pdf via UbuWeb. The fascinating 66-page document, published in 1984, was programmed by William Chamberlain and Thomas Etter; the programming took five years. Joan Hall created the marvelous illustrations (the document also is viewable here at Hall's site). ✦ This year marks the 50th anniversary of the publication of J.D. Salinger's Franny and Zooey and the 60th birthday of the classic The Catcher in the Rye. If you're an admirer, be sure to check out the site dedicated to Salinger and his work: dead caulfields, created in 2004 by Kenneth Slawenski. Slawenski recently penned a guest post about Franny and Zooey for the Reader's Almanac blog. ✦ I'd be willing to bet the Library of Congress has at least one blog you'll find interesting and want to follow. Here's a list to help get you started on your knowledge expansion. ✦ If you teach, you'll want to know about Teaching American History. ✦ At Inventing Entertainment: The Motion Pictures and Sound Recordings of the Edison Companies, you'll find 341 motion pictures, 81 disc sound recordings, and a range of related materials, including information about Thomas Edison's inventions, all searchable by keyword and subject. You may view and download some of the films, which were made between 1891 and 1918. See Reel Culture's "Where to Find Old Films Online, Streamed Legally and for Free" for other sites of interest. ✦ A new investment model that makes arts a generator for economic development, ArtPlace was announced September 15 by director Carol Coletta. In a post at ArtWorks, the blog of the National Endowment for the Arts, Coletta describes how the consortium of foundations, federal agencies, and financial institutions plans to use ArtPlace to revitalize our towns and cities. Take some time to browse the site to get an idea of some of the creative projects that have received grants to provide economic opportunity throughout the country. ✦ The Radev Collection of 800 artworks, including a Modigliani portrait of Soutine and works by Duncan Grant, Ben Nicholson, and Graham Sutherland, is being catalogued and added to a dedicated Website. The collection, amassed by picture framer Mattei Radev (1927-2009), was bequeathed to artist Eardley Knollys who, in turn, left the artworks to Edward Sackville-West. Through the efforts of curator Julian Machin, the artworks are coming into public view. ✭ A solo exhibition of the marvelous paper art of Ronnie Jolles opens October 30 at Katie's Coffee House in Great Falls, Virginia. The show, running through November 30, will include Jolles's newest work. Jolles uses paper from all over the world and acrylics, achieving a masterful painterly effect that delights with its layered textures. See selected images of her work here. Jolles most recently showed her work at the McLean ArtFest and also participated earlier this month in the Great Falls Studios Tour, which is where I first met her last year. 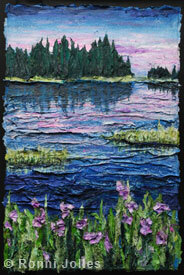 She's also scheduled for the American Craft Council show in Baltimore, Maryland, in February 2012. Layered Paper and Acrylics, 20" x 30"
✭ Anyone for a few hoops? If you in New York City, head to the Bronx Museum of the Arts to see Orange Tree, Alexandre Arrechea's 20-foot steel sculpture with "branches" of basketball hoops intended to represent fallen fruit. On view through January 2, the sculpture offers just one comment on the role of streets sports in urban culture. The Bronx Museum is the administrator of the smARTpower℠ project of the Bureau of Educational and Cultural Affairs of the United Sates Department of State. Under the auspices of smARTpower℠, 15 U.S. artists are sent abroad to work with local artists and youths to create community-based art projects. ✭ In Richmond, the Virginia Museum of Fine Arts continues through December 4 "Xu Bing: Tobacco Project". Xu Bing, considered one of China's most innovative contemporary artists, looks at the production and culture of tobacco, drawing on his visits to tobacco farms and warehouses, as well as cigarette factories in Virginia. In addition to new work, the exhibition includes work from two earlier projects, one at Duke University, where Xu Bing was an artist-in-residence in 2000 and created his first "Tobacco Project", involving his study of the history of the Duke family, and the other, "Xu Bing Tobacco Project: Shanghai", at the Shanghai Gallery of Art, for which he created in 2004 "Traveling Down the River", a 30-foot-long cigarette over a reproduction of a hand-scroll of a celebrated Chinese painting; burning, the cigarette scorched the image, thus "inscribing time as a serpentine scar and the journey as a residue of ash." Fascinating work! ✭ Jane Hammond's haunting monumental installation "Fallen", which I first noted in this post (an installation shot is included), when her work appeared at the VMFA, is on view through December 17 at Flag Art Foundation in New York City. For this appearance, the installation began with 4,455 unique, hand-made leaves, each inscribed with the name of a U.S. soldier who was killed in Iraq. (In its first showing in New York in 2005, it had more than 1,500 leaves.) The artist has been working on the installation, which has been acquired by the Whitney Museum of Art, for seven years; she continues to add leaves as more soldiers die. This is an especially moving work, so if you're in the City, don't miss it. The exhibition is open Wednesday through Saturday, 11:00 a.m. - 5:00 p.m.
✭ Also in New York City, at the Heller Gallery, is "Mutable Materiality", presenting the contemporary glass artistry of Josepha Gasch-Muche (images of work available currently at Heller is here). The exhibition is on view through November 12. From November 12 to December 24, the gallery will be showing the beautiful work of third-generation wood turner Matt Moulthrop (images here) and second-generation wood turner Philip Moulthrop (images here). ✭ The Sitka Center on the northern Oregon coast is holdings its 18th Annual Sitka Art Invitational, "The Ecology of Art: Collaboration and Connection", in Portland, Oregon, November 5-6. Each of the 120 invited artists was asked to invite another artist of choice and then encouraged to collaborate in creating a new work or works. The result is an anticipated 450 artworks for the benefit show and sale. I'm delighted to note that my friend the painter Randall David Tipton is among the invited artists. He collaborated with David Trowbridge. Tipton also is appearing with painter Molly Reeves through November 29 at The Narthex Gallery at St. Francis of Assisi Episcopal Church in Wilsonville, Oregon. 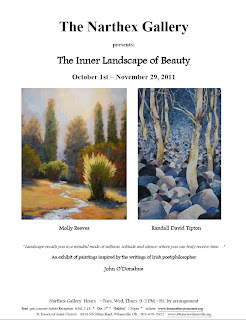 The exhibition, "The Inner Landscape of Beauty", is inspired by the writings of the late Irish poet and philosopher John O'Donohue.
. . . I am totally enamored of the simplicity of the line. We are all familiar with the line. We all use it. We all write. It's built into us. A solo exhibition of Meyers's Every now. And again., is at The Hammer Museum in Los Angeles until November 6. The creation of the wall drawing, which took Meyers twelve 14-hour days, was filmed for Hammer Projects, a series of exhibitions about the work of emerging artists. In the video below, Meyers talks about her process and techniques while showing us how she created the wall drawing on the lobby wall of the museum. Additional videos with Meyers are available at the Hammer's page at Art Babble. On November 16 at the Smithsonian American Art Museum, Meyers will be participating with other Washington, D.C., area printmakers in a free public program that complements the museum's exhibition "Multiplicity" opening November 11. * Quoted in the Anne Ellegood essay on The Hammer Museum site, from Ellegood's interview with the artist on March 27, 2011.
become a means of prayer. It is not often that I read a book straight through, and even rarer that I read straight through a book with a word like "knit" in its title. 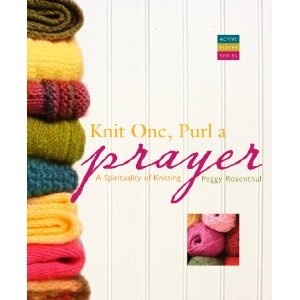 Still, when I picked up a copy of Peggy Rosenthal's Knit One, Purl a Prayer: A Spirituality of Knitting (Paraclete Press, November 2011), I read it in its entirety, in a single sitting, and came away thinking I should take up knitting. Rosenthal's is a lovely, well-researched, and personal book, from its appealing cover design of a pile of warm-colored knitwear to its beautifully composed writing and organization. Set in well-spaced, easy-on-the-eyes type, the book comprises just six chapters, each turning on the well-known phrase "knit one, purl two". In the Preface we first learn how Rosenthal came to regard knitting "as something like praying with prayer beads" but then, as she got more involved with the craft, came to see how "my spirit engaged in a new way." We are shown over the course of the book that it is possible not only to knit a prayer but also to purl pain. In Knit One we learn how the rhythmic movement of needles and yarn through the hands can be "an aid to settling the mind and spirit into deep repose"; how, wherever it's done, knitting invariably creates community, even as each individual knitter necessarily follows a pattern unique to the picture in her own mind; how the working of yarn into loops and stitches is a series of steps that can be model or guide, followed or broken, a metaphor for the steps, and missteps, we take in daily life; how, when life is filled with pain and grief, knitting, as both singular and communal act of creation, can be healing, requiring no words. By the concluding chapter, when we come full circle, we are able to link appreciation of the handcraft taken up by so many people the world over with understanding that what happens after those first intentional stitches and rows are made opens us up to something spiritually nourishing and sustaining. As Rosenthal relates in a final and moving personal story of how she came to own a blue prayer shawl, there is much more to knitting than can be imagined from browsing through a craft book or stepping into a store to purchase the simple tools of needles and yarns. Noteworthy are Rosenthal's inclusion in each chapter of one or more meditations that reinforce discoveries about the practice of knitting — as means of prayer, as meditative tool, as stress reliever, as problem-solver, as creative act — suggested activities, and a particularly generous helping of other knitters' voices. It is through the latter, these expressive, articulate, insightful, and often witty voices, that Rosenthal gives credence to her own narrative and meaning to a second definition of the word "purl". For purl is not only the knitting stitch that we create and can see; it embodies, through its definitional sense of motion and sound, a force that is invisible and works upon us. And, to our benefit, it is articulated again and again in the pages of Knit One. In sharing the many voices she has collected in her book, Rosenthal makes it possible to visualize the power of many knitting needles moving together with intention, sometimes at odds, sometimes in silence, but always with what Rosenthal describes as "astonished gratitude as a beautiful and useful object is created" through the work of the hands. "Making," the author repeatedly affirms, "is part of the essence of our humanity." A bonus that should not be overlooked: At the end of each chapter Rosenthal includes a knitting pattern (with supply list and instructions) that addresses that chapter's theme. And one suggestion: While reading, you might want to keep a highlighter ready to underline or star the numerous knitting-related Websites that Rosenthal mentions and the names of poets, professional writers, and bloggers whose wonderful stories and quotes about knitting she shares. Daily knitter Peggy Rosenthal, Ph.D., is the director of Poetry Retreats and the author of The Poets' Jesus (Oxford University Press), Praying the Gospels Through Poetry: Lent to Easter (St. Anthony Messenger Press), and Praying Through Poetry: Hope for Violent Times (St. Anthony Messenger Press), among other books. She blogs on spirituality and the arts at Image Journal's Good Letters blog. Award-winning artist Alison Clifford, currently studying for a doctorate in Glasgow, Scotland, has created or collaborated in creating a number of interactive new media projects in which literature, including poetry, combines with sound to highly imaginative, often engrossing visual effect. Having first learned about some of Clifford's work from the SFMOMA blog, Open Space, I sought out Clifford's "The Sweet Old Etcetera" (2006) project, which Clifford bases on the poetry of E.E. Cummings (1894-1962), an unconventional poet who delighted in breaking up words and lines and structures and brilliantly did so without sacrificing meaning to form. Clifford's work is best understood at the project's site, which invites personal interaction with Cummings's poetry. For the project, Clifford reinterprets a Cummings poem by putting individual letters or characters and symbols into playful motion, beginning with the symbol ( ). Clicking on that symbol begins the first step in filling the visual landscape with Cummings's words, which, with every successive click, begin to branch out, sway, and tumble or cascade, allowing the user to rebuild the poem, both its form and content, graphically. Sound accompanies each click (imagine initially a musician tuning, for example, or simply plucking). Where you may click can be a matter of trial and error, heightening the interactivity and making you pay more attention. I found the site irresistible. Another 2006 project is "Silhouette: A Dance", created for Born Magazine, in which Clifford interprets Addie Tsai's poem of the same name through its structure, different sequences of which present themselves with each replay or virtual reading of the poem. Again, to best grasp the concept of the project, it's necessary to engage with it directly. Palimpsest from Alison Clifford on Vimeo. Interestingly, Clifford's use of photographic light paintings links back to Picasso. Substratum from Alison Clifford on Vimeo. Not everyone may find this kind of experimental art-making to their liking, and that's okay; nonetheless, to my mind, Clifford and her collaborators are to be applauded for venturing so creatively into the medium of interactive Web-based art and digital literature. What they produce is conceptually brilliant, often gorgeous to behold, and sometimes just great fun and play. You write a poem. You are alive. . .
to something whole that's bigger than simply lament. In poetry I think you try to reconstruct what's humanity. Humanity is always a mix of crying and laughing. Zagajewski's most recent collection of poems is Unseen Hand (Farrar, Straus & Giroux, 2011). His other volumes include Eternal Enemies (Farrar, Straus & Giroux, 2009) and Without End: New and Selected Poems (Farrar, Straus & Giroux, 2003). Many of his poems can be found in The New Yorker, including "Try to praise the mutilated world", hyperlinked above. In this edition of Saturday Sharing, learn where at least some thrown-out objects get a second, if virtual, life; experience the engrossing Pine Point Revisited site; check out a new e-magazine about all things collage; browse the new online journal Poecology; and view a wonderful animation of John Siddique's poem "Vine Moon - Fire". ✦ The nonprofit Fractured Atlas has launched Artful.ly (in private beta) — secure, cloud-based events ticketing and relationship management for artists and arts organizations. Learn more about it here. ✦ Artist Seth Apter at the altered page recently spotlighted a new eMag, Collage in Color, that deserves being shared far and wide. Fully interactive, the virtual magazine highlights, through embedded slideshows and videos, tutorials, interviews, and images (you can pan and zoom), work of emerging and well-known artists, who offer their tips, tricks, and favorite techniques for creating collage. From Cloth Paper Scissors, the downloadable magazine for PC costs under $10.00 and can be enjoyed on- and offline. Learn more about it via these FAQs (additional installation FAQs are here) and then take a look at this preview. Vine Moon from John Siddique on Vimeo. ✦ The Division of Rare and Manuscript Collections at Cornell University Library has created a wonderful online exhibition: "Werner Pfeiffer: Book Objects & Artist Books". A justly celebrated printmaker, sculptor, painter, and collagist, Pfeiffer has exhibited in solo and group shows all over the world. The online exhibition is the digital version of a physical exhibition at Cornell that ended in February 2011, having earlier traveled to several other locations in the United States and Canada. Begin here with a brief introduction to and explanation of Pfeiffer's work and then continue to the next two sections, which examine each type of artwork, book objects and artist books, in more detail. Pfeiffer's work is beautifully conceived and executed. Pfeiffer's marvelous Out of the Sky: 9/11 is an artist's book that assembles from a series of printed segments into two nearly six-foot tall sculptural models of the Twin Towers. It's Pfeiffer's tribute to those who died on September 11, 2001. This extraordinary artwork was produced in 2006 in an edition of 52 copies. In the video below, by Pfeiffer's son Jan Pfeiffer, the artist talks about Out of the Sky. Also see online these images of the artwork, which is part of the National September 11 Memorial and Museum, and this introductory video (also directed by Jan Pfeiffer) that accompanied the artwork on its earlier travels to universities and art galleries. Most recently Out of the Sky was included in "Afterwards and Forward: A Ten-Year 9/11 Reflective Art Exhibition". ✦ This year marks the 250th anniversary of the publication in 1761 of Laurence Sterne's marbled page in Volume III of his novel Tristram Shandy. 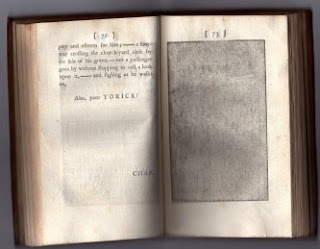 Because the page (numbered 169; see image below) originally was hand-made, the impression in each copy (edition) of the volume was unique. (That, of course, is not the case today, as all are identical.) Examples from the various unique copies reside in the Laurence Sterne Trust collection. To celebrate the anniversary, 169 artists and writers were invited to design an emblem of their own work, and every emblem is available for sale by auction, each a donation from its maker. 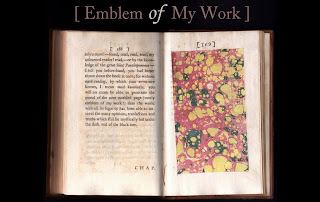 An online exhibition, "The Emblem of My Work", is available here (be sure to click through "older posts" to seem all 77 included online); although the site lists all the artists' names, none of the names is associated with any one emblem; the artists' names will not be revealed until after the auction. 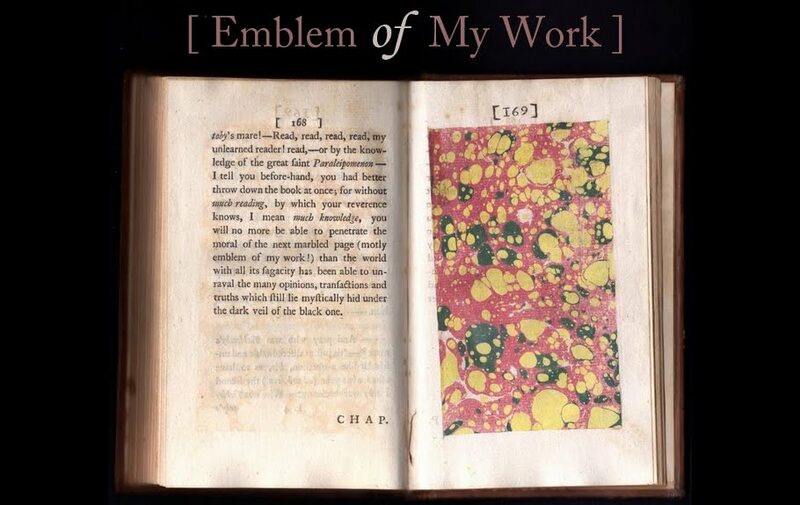 A physical exhibition, "Emblem of My Work", is on view until October 31 at Shandy Hall in North Yorkshire, United Kingdom. Also of interest: "The Black Page" Exhibition (online). Page 73 of Volume I of the original novel (see image below) is a black page marking the death of Parson Yorick; for the anniversary celebration, 73 artists and writers, among them Richard Askwith, John Baldessari, Emma Biggs, and J.M. Coetzee, were asked to create a black page for exhibition and sale by auction. 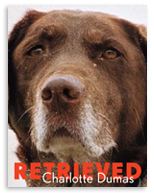 ✦ Dutch photographer Charlotte Dumas has published the forthcoming Retrieved (The Ice Plant, October 31 2011), comprising her images of trained search dogs that assisted in rescue-and-retrieval efforts following the attacks of September 11. A decade after the attacks, Dumas learned that 15 of the dogs were alive, tracked down each one, and visited and photographed each with his or handler. Dumas shot the often moving portraits in natural light. Dumas, who lives and works in Amsterdam and New York City, is also the author of a number of other books of photography, including Repose (also available at Photo-Eye Bookstore), Pardis, and Heart Shaped Hole. ✭ Censorship in America is the subject of "Banned, Burned, Seized, and Censored" at Harry Ransom Center at the University of Texas/Austin. 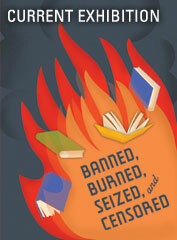 The exhibition, which runs through January 22, 2012, reveals how, in the decades between World Wars I and II, a nationwide effort took hold to remove "objectionable" literature, whether in books, magazines, pamphlets, or postcards, by confiscations, burnings, and other methods. A list of books and movies related to the exhibition is here. ✭ In New York City, Paula Cooper Gallery is showing through October 22 "Roy Lichtenstein: Entablatures", paintings created between 1971 and 1976 that take as their source Greek and Roman examples of the architectural element found above columns of buildings. 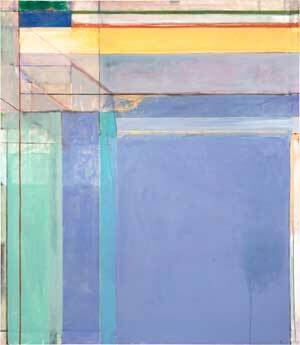 ✭ The Modern Art Museum, Fort Worth, Texas, has mounted an exhibition of the marvelous "Richard Diebenkorn: The Ocean Park Series". On view through January 15, 2012, the comprehensive show features more than 75 of Diebenkorn's Ocean Park paintings, drawings, and prints spanning two decades. The works have been borrowed from private and museum collections and have rarely been seen together. A catalogue accompanies the exhibition, which will travel to the Orange County Museum of Art in Newport Beach, California (February 26 - May 27), and conclude at the Corcoran Gallery of Art in Washington, D.C.
✭ Southern California's Orange County Museum of Art has opened "Two Schools of Cool", on view through January 22, 2012. The show pairs collaborating teams of artists representing two generations: John Baldessari and Shana Lutker, Llyn Foulkes and Stanya Kahn, George Herms and Sarah Cain, Allen Ruppersberg and Amanda Ross-Ho, and Robert Williams and Ed Moses. Each pair of artists presents a mixed-media installation, conceived and developed before the exhibition. A fully illustrated catalogue with interviews with the paired artists accompanies the show. ✭ Award-winning author and inventive illustrator Ezra Jack Keats (1916-1983) is the subject of "The Snowy Day and the Art of Ezra Jack Keats" at The Jewish Museum, New York City, through January 29, 2012. The show, the first to pay tribute to Keats, includes more than 80 of the artist's originals, ranging from preliminary sketches, dummies, and preparatory books, to final paintings and collages. A catalogue of the same title accompanies the show. Among the children's books illustrated by Keats are Dreams, Whistle for Willie, A Letter to Amy, Peter's Chair, and The Snowy Day; the latter, published in 1962 and celebrating its 50th anniversary in 2012, was the first full-color picture book to feature an African-American protagonist.